Wheelchair-bound? No problem, just build a truck around it! So where do you go on holiday if your lad suffers from Cerebral Palsy and spends all his time in an electric wheelchair? Book into a specialist wheelchair-friendly facility in the UK surrounded by fellow sufferers? Granted the centre may be perfectly adequate, but hardly an inspiring two week break. However, if one day your son suddenly asks, “Dad, is it possible to go on an adventure, something big and off the beaten track”, what would be your answer? Well, James is not only fortunate enough to have an incredibly caring father, dad is also the type of person who can think ‘outside the box’. The solution? Pop over to Holland, buy a 4×4 truck, have it fitted out in Yorkshire … job’s a good ‘un! Oops! I nearly forgot the best bit. That two-week holiday I mentioned, well it’s now turned into a trans-global adventure lasting 10-15 years! Why not? James is the son, Dudley is the father, and sure enough the Greens will be off on their marathon trek just as soon as the truck’s conversion is complete. The body is virtually complete so at the tail end of January 2019 it went off to the paint-shop, now all that’s left is fitting out the interior. But why such a drastic step up from a short break in the UK to an epic round-the-world adventure? In actual fact it wasn’t quite as sudden as all that, for it transpires that Dudley had visited the Adventure Overland Show over the past three years, the purpose being to acquire knowledge about converting a basic commercial vehicle into an expedition truck. The seminars must have helped as ‘converting your van/Land Rover/truck into a camper’ are a reoccurring theme. Routes, planning and preparation were also major factors, all of which had to be learnt. These too are a staple of the event as bikers, 4×4 and truck owners pass on their considerable knowledge via the talks. So far so good, next step was finding a vehicle. This was sourced over in the Netherlands at the truck dealership Mainstreet (www.facebook.com/mainstreettruckcompany ). The proprietor Erik van Vliet was extremely helpful, so much so he even brought the M.A.N. LE220B 4×4 truck over to the UK; now that’s what you call service! You could say that James was a ‘little excited’ when his truck fired up for the first time. Next on the agenda was the hardest step so far, finding a company not only capable of converting a lorry into a basic camper, but one that could design and construct a vehicle around James’ large, electric wheelchair. This was not easy. Having scoured mainland Europe for a suitable company, countries such as Holland, Poland and Germany, low and behold the best by a country mile was found right here in merry ol’ England … in that there Yorkshire to be precise!!! Based in Doncaster, Motorcraft Conversions (www.motorcraftconversions.com ) proved to be absolutely the right choice, for the owner Ian Parkin-Coates was up for the challenge from Day One. According to Dudley, “Ian and his team have bent over backwards to help, I’m very grateful for that”. So, with the show rapidly approaching, how is the conversion going? In short the answer is … it’s looking pretty good! 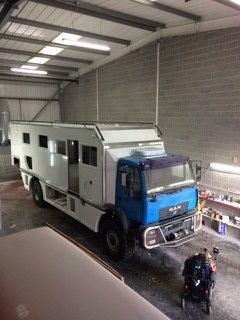 ‘Elmo’ the expedition truck nears completion. Back from the paint-shop and resplendent in its new livery, now it’s full steam ahead with the internals. With the dream of Dudley and James fast becoming a reality, hopefully come show time it will be complete and ready for public display – can’t wait!